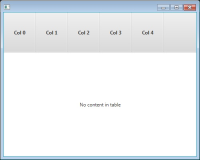 The layout of table and tree table view column headers becomes messed up when specifying a preferred height for the column headers inside a stylesheet. Run this application. Make sure the stylesheet.css file is in the same location. The five column headers created by the test application should be simply taller than their default height. They should be as tall as the value specified via -fx-pref-height inside the stylesheet. 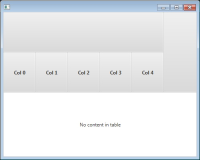 The column headers do have the specified new height but in addition one can see a blank column header above spanning all five columns. It almost looks like a parent column header.